Australia 204 and 0-30 (Chris Rogers 18, David Warner 12) trails England 255 and 179 (Alastair Cook 51, Kevin Pietersen 49, Nathan Lyon 5-50, Mitchell Johnson 3-25) by 201 runs with all wickets in hand. The first innings of the Englishmen was squeezed for 255 followed by 179 in the second. 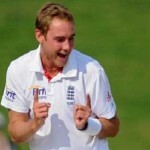 The Aussies were bowled out for 204 in the first and scored 30 without any loss in the second innings after 8 overs. The third day’s play of the fourth Ashes Test came to an end on Saturday, December 28, 2013, at Melbourne Cricket Ground. Earlier, the hosts commenced their first innings at 9-164 in 73.3 overs whereas Brad Haddin was batting at 43 and Nathan Lyon joined him in the morning. The first reached his 16th Test fifty in the 79th over and was gone for 65 as the Kangaroos managed 204 in 82.2 overs. James Anderson was the supreme bowler with four wickets, Stuart Broad held three, Tim Bresnan two and Ben Stokes got one wicket. England gained a valuable first innings lead of 51 runs and their captain, Alastair Cook, along with Michael Carberry provided them a reasonable start. The first was the most aggressive of the two and attained his 35th Test half century on the 60th ball with seven fours. The opening partnership was broken at 65 when Cook was declared leg before wicket off Mitchell Johnson for 51. The middle order batting of the tourists surrendered again as Carberry lost his wicket at 86 for 12 and the next two wickets fell with the addition of just one run. Kevin Pietersen witnessed the disaster of the batting of his side at the other and became the ninth victim at 179 after scoring 49 runs. Jonny Bairstow contributed 21 as the entire innings of the English side was rolled back for 179. 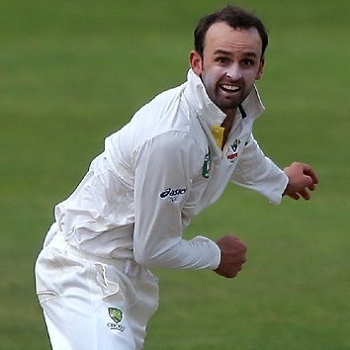 Nathan Lyon was the star performer with five wickets, Mitchell Johnson claimed three whereas Peter Siddle chipped in with one wicket. 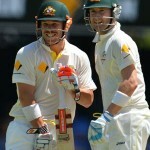 The Aussies required 231 runs to win the game while Chris Rogers and David Warner opened their second innings confidently. They remained unbeaten for 18 and 12 as the total touched 30 after consuming eight overs. Australia requires another 201 runs to clinch the encounter and they will most likely win the game on the fourth day subject to a deadly bowling by the England bowlers.